← Because architecture is art: Musee d’Orsay, at last! As I laced up my boots this morning, in my little Parisian studio, I was transported to that magical evening in Quito last year when, entirely by chance, I happened to buy them. In that moment, Paris blended into Quito and I hugged myself, thankful for the opportunities, and holding close that all consuming love for travel and adventure. Back to that October evening in one of the highest cities in the world. The altitude must have made us dizzy, my friend and I, because we were giggling and chattering like schoolgirls as we walked back from the craziness of Habitat 3, a large conference on sustainable urban development that the United Nations had organised. The day’s events had overwhelmed us, and we were looking for fun. My brown boots, bought lovingly my Rahul a few years ago in London (hilariously via a series of whatsapp messaging that flew across the world as his colleague modelled each pair in a succession of shops in suburban London) were beginning to fall apart. On a lark, I entered a footwear store we crossed. This was no ordinary shoe shop selling mass manufactured shoes made half the globe away! Nope, this was a shoemaker’s atelier, where each piece had been handmade with love and care. I was over the moon! Looking around, I saw this pair. 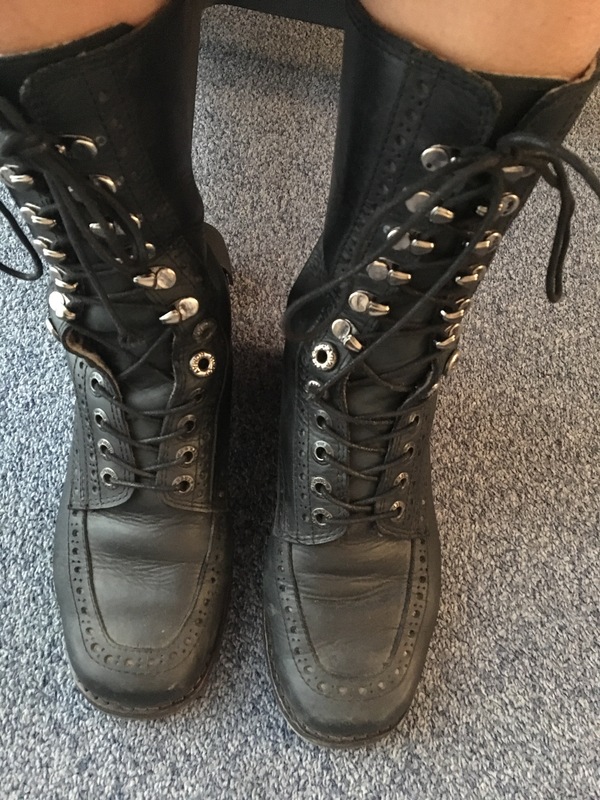 Black military boots that looked like they would be super comfy. And they were, perfectly fitting too! I refused to take them off and the shoemaker was thrilled. He showed us his entire workshop. He babbled incessantly in Spanish regardless of whether we understood him. 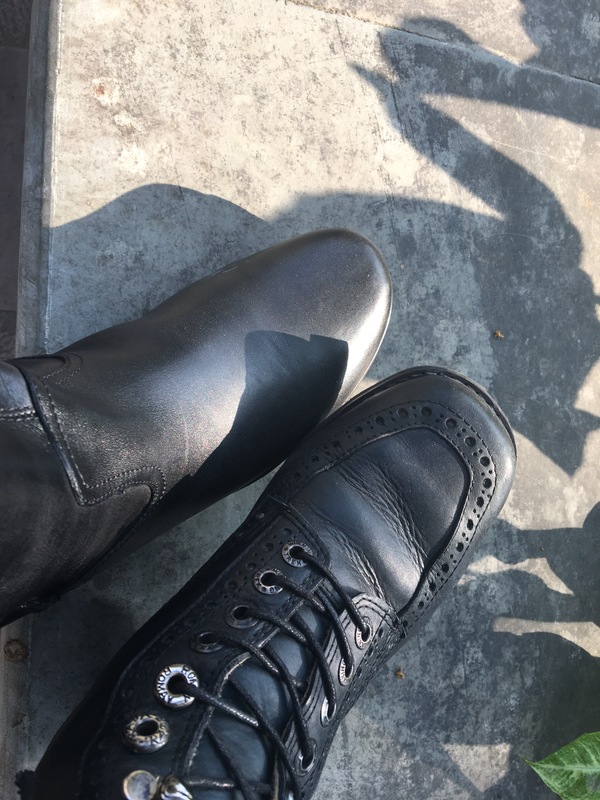 He kept calling me “Chica” with great affection, making me sit and pose with my new boots as he tried to click pics from his really basic phone, staring myopically into it. Finally, after my dear talented friend had bargained sufficiently, we had a final obstacle to overcome. Change!! No one takes a 100 dollars easily in Ecuador. So we put shutters on the shoe shop and marched down to the local grocery store, where change was available. Here, we were accosted by excited cries of “Namaste, meri jaan!” by local girls who had apparently picked this up from an Indian friend! We walked away in total elation. Boots bought and adventure had. My boots with dear friend’s boots. Pic clicked months later in Delhi, as we shared that good story once again!! Posted on September 26, 2017, in Travel & Experiences and tagged Adventure, friendship, Paris, people, Quito, Travel. Bookmark the permalink. 1 Comment. Really loved this one, and the pictures of. Ourse!